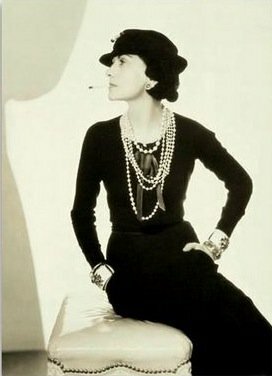 The first little black dress was designed in 1920s Paris, by Coco Chanel and Jean Patou. It quickly became a "uniform for all women of taste," as Vogue magazine predicted at the time. Before the 1920s, the color black was only worn in periods of mourning. Women who wore black were considered indecent or sinful. After the first world war, as well as the outbreak of Spanish Influenza, it became common in France to see women wearing black for long periods of time, and the stigma lifted somewhat. A part of the "anti-corset" generation, Chanel invented much of women's style as we know it. She once described her work as "nothing more than transform[ing] men's clothing into women's jackets, haircuts, ties and cuffs." She worked hard to create clothes both simple and sophisticated, even if they created scandal. Women were drawn to the dress by its simplicity, elegance and cost. A few years later, the Great Depression forced many people to economize, which increased the popularity of the little black dress as a cheap way to look smart. Nettie Rosenstein, a New York-based designer, popularized the dress in the United States. Though some claim she invented the dress before Chanel, the evidence is slim. Elsa Schiaparelli, Chanel's rival, put her own fantastic twist on the LBD, by introducing a wrap-around version. "Chanel's Ford," as the press then called it, had long sleeves. Subsequent decades have removed the sleeves and shortened the hemline. Perhaps the most famous little black dress was worn by Audrey Hepburn for "Breakfast at Tiffany's," not to mention the one worn by Betty Boop. Today, every style guide trumpets the dress as a wardrobe staple for all women. And it's no wonder. The little black dress is practical, stylish, and looks good on people of all body types and skintones. It's slimming and doesn't draw attention to itself, making it perfect for showing off an accessory––or for eluding the male gaze. Edith Piaf, the "little black sparrow," wore simple black outfits so audiences would focus more on her singing than her appearance. This dress is typically worn at parties, fancy dinners, dressy events (e.g. galas, gallery openings) and, yes, funerals. If you're not sure how to pick out a dress, or what kind looks good on you, these guidelines might help you. Find a retailer whose outfits usually fit you. Even if you shop at goodwill, take note of what brands flatter your figure. You might also find that a certain vintage really fits your body shape. If you have an hourglass figure, for example, 1950s and 60s American fashions will play up your curves without being baggy or tight. See if there are any shops in your area that specialize in vintage fashions. Find a cut that flatters your best feature. If you have large breasts, a v-neck or low-cut neckline will show off your curves. If you have nice legs, consider a shorter hemline. Keep it simple. If you're choosing between two dresses, ceteris paribus, opt for the one with less visual clutter. Bring a friend. The staff at any store have a conflict of interest, however nice they are. Since your purchases pay their salary, they want you to spend as much as you can. A friend will probably be more honest, and can add support against an overbearing salesclerk. Choose quality over quantity. Since this is a wardrobe staple, you'll want one that endures through the years. Save up for wardrobe staples like this; you won't regret it. Little black dress photo by Tasha Gear, used under a CC Attribution-NoDerivs license. Decades of Beauty. Husain, Humaira, ed. Checkmark Books, New York, 1998. Icons of Fashion the 20th Century. Buxbaum, Gerda, ed. Prestel Verlag, Munich. 2005. The Little Black Dress. Papierdoll Magazine. Accessed 20 January 2010.